S - SHOULDER 13.5 in. / BUST 34 in. / SLEEVE 16.5 in. / LENGTH 22.5 in. M - SHOULDER 14 in. / BUST 36 in. / SLEEVE 16.5 in. / LENGTH 23 in. L - SHOULDER 14.5 in. / BUST 38 in. / SLEEVE 17 in. / LENGTH 23.5 in. 1XL - SHOULDER 15.5 in. / BUST 40 in. / SLEEVE 17 in. / LENGTH 25 in. 2XL - SHOULDER 16 in. / BUST 42 in. / SLEEVE 17.5 in. / LENGTH 25.5 in. 3XL - SHOULDER 16.5 in. / BUST 44 in. / SLEEVE 18 in. / LENGTH 26 in. Top quality button down shirt. 3/4 folded cuff sleeves. Elastic material. Basic collar. Two line stitched design on the front. Perfect for any occasions. 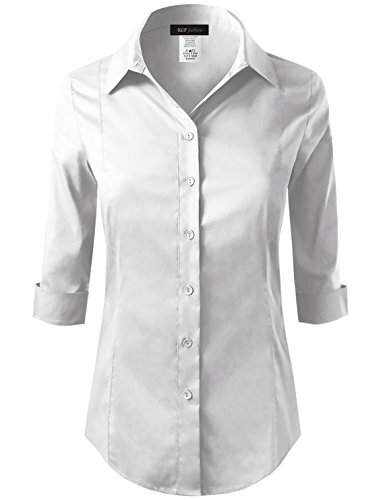 You can easily wear for formal office, work, seminar, casual, business, dating, party, etc. Hand wash with cold water, Line dry, Do not bleach, Please check the label inside the clothing for wash info. Please check the size chart in our images to ensure your order / Color disclaimer : Due to monitor settings and monitor pixel definition, we cannot guarantee the color that you see will be exact from the actual color of the product. If you have any questions about this product by ELF FASHION, contact us by completing and submitting the form below. If you are looking for a specif part number, please include it with your message.